Some of the great pastimes of sum­mer include swimming, staying out late to catch lightening bugs, or just enjoying the warmth of the day outside playing. Summer should be a time for adventure, fun and outdoor play. To ensure this, we must be mindful of how to best protect our kids from the heat, illnesses and pos­sible dangers that can accompany sum­mer fun. I hope these few tips will help keep your kids safe and persistently ac­tive this summer. Protecting kids from sunburn is im­portant both to prevent the immediate pain, and to protect from long term sun damage. Sunscreen is widely available, but it is only effective if used properly. Sunscreen should be at least an SPF (Sun Protective Factor) of 15, applied 15-30 minutes prior to sun exposure, and re­applied every 2-4 hours, especially after swimming, towel drying, or excessive sweating. Another way to protect kids from the sun is by wearing light colored, long-sleeved clothing and large brimmed hats. This is especially important since sunscreen should not be applied to chil­dren under the age of 6 months. When sunburn does occur, the most effective medication that can be given for the pain is ibuprofen. It not only treats the pain, but also helps reduce the inflammation that is causing the pain. Using lotions that contain aloe, or having an aloe plant around can be very helpful as well with soothing the skin after a sunburn. Hydration during outdoor summer activities is extremely important in or­der to prevent heat exhaustion and heat stroke. As a general guide, kids should drink a cup of fluid 30 minutes before outdoor activity begins. Once playing in the heat, kids under 90 pounds should drink at least a cup an hour and kids over 90 pounds should drink at least 2 cups. These are rough estimates, and if it is ex­tremely hot and kids are sweating a lot, they may need more. When choosing the type of drink, water is best. Sports drinks and/or coconut water can be a helpful addition since they contain re­placements of the electrolytes that can be lost in sweat, but should not be the sole source of fluid replacement, just an addi­tive to the main source of water. In situ­ations of very heavy perspiration, even these electrolyte replacement choices may not be enough, and you may need some pretzels or other salty food choice. Also, a good rule of thumb is that if the drink has caffeine in it (most soda’s and iced tea), it is not going to be a good choice. Caffeine causes you to urinate more, thereby losing more fluid. Finally, watch for warning signs of dehydra­tion such as thirst, dry or sticky mouth, headache, muscle cramping, irritability, extreme fatigue, weakness, dizziness, or decreased performance as a sign that you may need to seek medical attention for your child. How better to cool off during the hot times of day than by going for a swim in the pool or lake. This can be a source of some of the most wonderful childhood memories, but it can also be a source of tragedy. Every year, nearly 700 kids (age 0-14 years) die in drowning accidents, and at least 5 times that many are seen in the ER for near drowning injuries. The majority of these happen in pools with younger children. As kids get closer to adulthood, natural water locations be­come the more likely place for injuries, such as jumping off cliffs into lakes and breaking legs, etc. While these activities can be extremely fun, there are steps that can be taken to ensure water safety: 1.) Make sure that any pool is surrounded by a 4 sided fence (i.e. the patio doors on the back of the house do not count), 2.) Always have a responsible adult watch­ing kids while they are swimming, 3.) Kids should wear life jackets, especially in natural water habitats, 4.) Never dive into shallow water and, if you cannot see the bottom, assume it is shallow and 5.) Swimming lessons can help reduce the risk of drowning, especially for younger children. Some of the best times of day dur­ing summer are the early mornings or late evenings, when the temperatures are not as hot. It is these cooler times that allow kids (and their parents) to go out and catch lightening bugs; and if they aren’t careful, they will end up with a few bugs catching them right back. Mosquitos and other biting insects are much more prevalent during the cooler times, and ticks can be very pesky if kids are out playing near woods or with ani­mals. To help prevent illnesses that can be caught from insects, it is helpful to use insect repellent on exposed skin. There are all kind of choices, however, accord­ing to most studies, the most effective is repellants that contain DEET—a chemi­cal that makes us not taste as good to in­sects. However, since it is a chemical, the American Academy of Pediatrics has recommended a cautious approach in using this product on children 2-12. By choosing a product with 10 percent or less of DEET, it will provide protection, but just for not as long as the products with higher concentration. A good rule of thumb is that 10% of DEET will protect for 30-45 minutes. Therefore, if you are going to be outside for longer than that, a reapplication is likely necessary. Long sleeves and pants can provide a second line of defense. While Deet containing products are the most, well established and proven way to reduce insect bites, if you are uncomfortable using Deet, use of natural products may provide benefit so try to use something. And remember, while it may not make your kid look real cool, tucking pants into socks is a great way to keep ticks from crawling up the legs under the clothes. And if you have ever had to pick more than 10 ticks off your child (or yourself), you look for any way possible to prevent those bites. Summer months bring many visits to our office with concern about insect bites. Remember, insect bites sometimes are very itchy, sometimes they do get infected, and there are more significant illnesses that can be transmitted through insects. A few tips for the itching, using Benadryl (or generic version) cream to the bite can be very helpful. There are also some of the old remedies that we may all remember from our child hood. 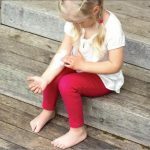 Calamine lotion is still a great choice, although they have created a newer for­mulation so that your kid doesn’t have to have pink spots all over them. Epsom salt or oatmeal baths can help to soothe itchy skin. Other ways to address itching are using oils, such as lavender, and if you don’t know where to get these, just ask around, you will be able to find someone who sells them! Of course, it is good to keep in mind that if the bites are getting much more red than you think is normal, this could be a sign of infection. If there is pus draining from the spot, it is not just the bug bite, there is something more go­ing on. And if your child develops fever, headaches, stomachaches or a rash after bug bites, these are symptoms that de­mand immediate evaluation with your doctor. And one last tip for the summer— NEVER leave a child alone in a car, even for “just a minute”. Cracking a window or sunroof does not make it ok to leave a child alone in a car. Kids’ bodies can heat up 5 times faster than an adult’s and a car can heat up by 19 degrees every 10 min­utes on hot summer days. So don’t risk it, just never leave a kid alone in a car. I hope these few tips can help your family have a fun filled summer. For more in depth information about the above topics, visit the websites below or speak with your pediatrician for further recommendations.